Taylor sets new record: Ohio Open Water Championships! The official results have finally been posted. 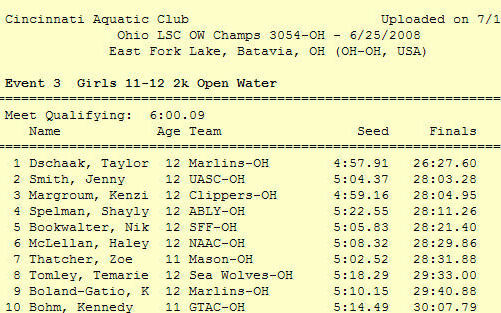 Taylor officially broke the record for the Ohio LSC Open Water Championships besting her record time for 11-12 Girls from last year by 46 seconds! She beat the 2nd place girl by 1 minute and 36 seconds!! Taylor Ohio State 2008 Open Water Champ! Today we traveled out to East Fork Lake here in Cincinnati for the Ohio LSC 2008 Open Water Championships. Taylor was defending her title from last year and looking to improve on her record setting time. She would be swimming 2,000 meters on a course that was essentially a line with a lap being 1,000 meters. They changed up the start this year with all swimmers starting in the water holding a rope in a line (green line on diagram). Last year they started in heats out of the water and running into the water. Taylor had a strategy which was to be close but not be too close to the course line then get out quick away from the pack. In open water swimming there are no lanes and getting kicked, hit, or even pulled on is not uncommon, so she wanted to get in front quick. Shortly after the start she was 3rd. The 1st place girl took off fast and had a decent lead pretty quick. As they swam away from the start it was harder and harder to see them in the distance. Also, the end of the course had drifted out further in the lake, so it was no longer a straight line (see diagram). At the bend it looked like Taylor was in the lead. As she passed by us going down the course she clearly was in the lead by a large amount. She just kept pulling away, since she didn’t have anyone in front of her and she wanted to stay out front. At this point I was worried she might be going out too strong as this is not something she has practiced or has as a regular competition. As she continued to swim and there was no one around her she was wondering if she had made a mistake and was off course, so more than once stopped to look behind her and see where the other swimmers were. The next closest was probably a 100 yards behind, so they were not easy to see, but she continued on. The winner gets a warm up jacket in addition to the Gold medal.